A little while ago an email arrived from Eileen Bolinsky, the senior editor of an environmental radio show called Living on Earth, which airs on National Public Radio. She asked if I would be interested in adapting the blog post Green Packaging into a piece for the show. I, of course, was delighted. Living on Earth is one of the shows I listen to on my Saturday KQED allstar line-up, beginning with Cah Tawk, Wait Wait Don't Tell Me! (I used to be SO good at this game! ), This American Life, and eventually Living on Earth. And, lest the radio shows I listen to damage my frivolous street cred, I should probably tell you LoE ends just in time for me to begin contemplating what to wear to dinner on a Saturday night. Adapting the blog piece for the radio was an interesting exercise, actually. It gave me an entirely new respect for the podcasters among us. I had to pay attention to everything, not just wording and phrasing but also the sound and rhythm of the words and sentences when read out loud. Thank goodness Eileen had an inexhaustible supply of patience to guide me along to the end. She was even present –albeit virtually- at KQED recording studio when I went in to read the piece. And if I'd thought rewriting a blog post for the radio was quite an exercise, recording it proved to be a new challenge entirely. Where was Ira Glass when I needed him? Imagine my surprise when an instruction from the producer went like this: "I want you to read this graph and I want you to be indignant!" Indignant? At the bamboo sticks? Oy! And it didn't end there. "That was great!" he said, "now lets do this other graph and can we have lament?" Huh huh. It was all I could do to stay serious. I'm no actress so telling me to do lament is just giving me a good fit of giggles. But I must say, all in all it was more than a little fun. Get the MP3 file on the Living on Earth website. P.S. While you are there you might want to listen to the other segments on the show as well. The one on sugar sweetened drinks and obesity epidemic in kids, especially, is great! Since we are just beginning the new Ingredients series, I should probably be writing more about basic Thai ingredients before I venture out to more seasonal and harder to find stuff. But this is the height of the season for this particular ingredient, and I've been using a lot of it in my recent cooking, and it's probably a good idea to do this before the season is over. What is this, you asked? This is young ginger. It looks more like galangal than it does ginger, but if you scratch a bit of the skin of and give it a sniff, you'd know that it is indeed ginger. Young ginger makes an appearance in Chinese or Asian markets around the beginning of Spring, and usually hangs around until Summer time. The flavor of young ginger is at once similar to and different from old ginger. 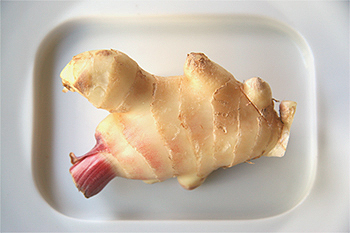 It has all the pure flavor and brightness of ginger, without the strong bitter and astringent taste in older ginger. You can a lot of young ginger in a recipe without turning whatever you are making inedibly astringent and spicy. I use young ginger in a lot of dishes, but one of my favorite is inspired by a Chinese dish of steamed fish with ginger and scallion. I made a couple of adaptations to suit the way I cook. I use fish filet instead of whole fish, and I don't steam my fish. The only steamer I have is huge, and I am usually far too impatient to wait for the water to boil and then steam anything. 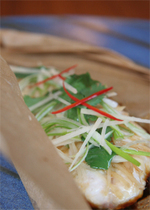 Instead, I bake my fish filet in a paper parcel instead, borrowing from an old French technique called en papillote. The effect is pretty much the same. The paper parcel keeps moisture in the fish just as well as steaming does, and when you are done eating the paper goes in the garbage, no pot or pan to wash. In my last post on Gang Som, someone left an interesting comment on the question of ingredients I use. I've always made a point to say that these exotic ingredients are difficult to give precise measurement for, since they are hardly standardized. This is certainly a problem in writing Thai recipes, because 5 tablespoon of tamarind, for example, will have varying degree of sourness and thickness, depending on the source and the preparation of your tamarind paste. I think it would be helpful to write about some of the ingredients that I use in my Thai cooking. How to select for quality. What brand(s) I use. How to prepare, use and store. How to properly measure them for the recipes. The first one I want to begin with is the palm sugar, ubiquitous in Thai cooking and some other Asian cuisines, but not at all in the west. Inspired by my thai cooking session with Slow Food, I've been talking a bit about the history of Thai food on Chez Pim. This post is the third installment, you might want to check out Part I and Part II as well. A lot of coconut based curries are quite well-known and popular in Thai restaurants outside of Thailand. Less well-known are coconut free curries, like Gang Som (sour curry) and Gang Pah (Jungle curry). It's too bad, really, because these coconut free curries are every bit as good, if not even better because it's also good for your diet. Tonight I made my favorite coconut-free curry called Gang Som. I used the paste that I brought back with me from Thailand. It's homemade, still, since it was made at my home in Bangkok and packed for me to take back to the US. The curry paste itself isn't hard to make though. I've done it plenty of times. It is far superior than anything you could buy in a can, so I really suggest you make it yourself. 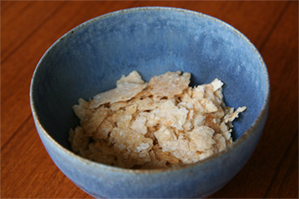 The ingredients are quite easily available, even, so there is really no reason for you not to make it yourself. Gang Som is made from a type of red curry paste, which could be made from dried chillies as well as from fresh chillies. My family is more in favor of the paste made from fresh chillies, so that's what I usually do. The main flavoring ingredients are the chilli paste, tamarind, and fish sauce. 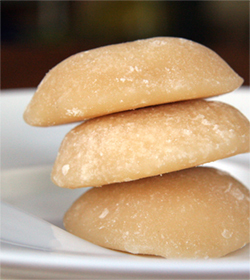 There's a bit of palm sugar in it too, not to make it sweet but just to round up the taste a bit. Shrimp paste gives the paste a bit of complexity, but it is entirely optional. I make my Gang Som with shrimp, again from family habits, but you can just as well do it with practically any white fish. Thai food, when we really think about it, is really far more Ferran Adrià-esque than it is Alice Water-ish. We take an ingredient and work at it –pradit pradoy, as we say in Thai- until in the end it sometimes resembles so little of the original form. An example for this is Pla-dook Foo or crispy fried catfish, my favorite accompaniment to many types of pungent Nam-prik relish. We take a catfish, cook it on the fire until done, take the cooked flesh off the bones and fluff it up with the tines of a fork, then deep fry that fish meat until it is crispy. The end result of this is hardly recognizable as fish, more like clumps of cloud. Oddly crispy kind of cloud. You'd never guess that it was fish until someone clues you in. We are fond of apparently odd pairings, like the Pla-dook Foo that we have just spoken about, which is paired with not only the pungent Nam-prik relish, but also with caramelized pork belly. There is also a snack dish of salty dried fish tossed with sugar and paired with watermelon (Pla-hang Tang-mo) which is sometimes served with sweet sticky rice. And then there is Khao-tung Jompol, my favorite store-bought snack of all time. It's made from rice, cooked to a paste and then spread thin and air-dried. The resulting dried rice paper is broken into large chunks and fried, then broken again to smaller chunks and tossed with sugar, salt, and pork candy floss (Moo Yong). Yes, I said pork candy floss. It's just what you read, pork cooked with lots of sugar until it resembles candy floss or cotton candy. My friend Eric said that this could have walked out of an El Bulli cookbook. I can see that too, can you? No, I'm not poking fun of my own recent tardiness on this blog. 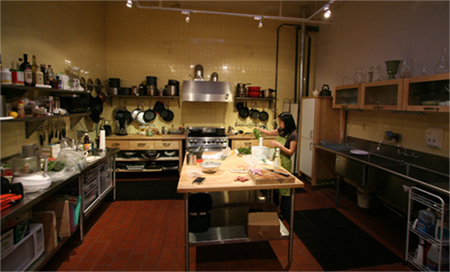 I am speaking of my evening cooking for and speaking about Thai food to the Aqua Terra Slow Food Covivium in Oakland. We made two savory dishes and one dessert: Panang Neua, beef in Panang curry served on toasted bread, Kanom Jeen Nam-prik, rice noodle with shrimp and coconut sauce, and a cold dessert 'soup' with lychees and oranges. The Panang recipe is already on the blog, but for the other two dishes you would have to wait until May, when they will be published on a certain newspaper. You can wait, can't you? It will be worth it, I promise. Preparing for that evening really got me thinking about the social history of Thai food. 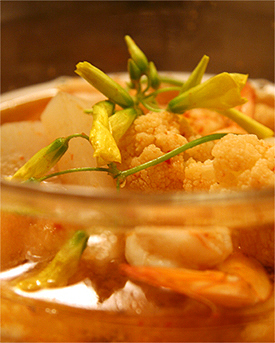 For Thai people, the love of food is not only ingrained in the culture, it is in our bones. Let me just give you an example. In the 1890's, the then Crown Prince Issarasundorn, who would later become King Rama II, composed 45 quatrains of Gabhya Hae Shom Krueng Khao Wan, poems in praise of savory and sweet dishes. He referred to more than 60 unique dishes, each with precise details of the key ingredients and –at times- their origin, all lavished with vivid images of flavors and aromas. And, just as in any other respectable epic poem, these 45 quatrains -ostensibly about food and hedonism- also contain subtexts about forbidden love and longing. Redolent of cumin and other spices. No, despite the reputation of this blog, a Pacojet is not the kind of jet that can set you somewhere, although it has been referred to as the Ferrari of kitchen toys. 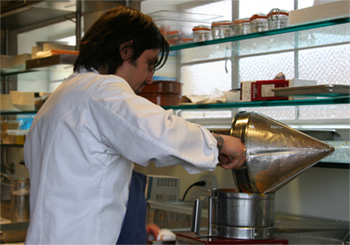 It is an ice-cream maker extraordinaire, making sorbets so light you'd think you are eating the cloud. It costs $3,000. And the best place to buy it is at Le Sanctuaire in Santa Monica. And, no, the Pacojet isn't there merely because it is expensive. This is not that kind of a store. The Pacojet is there because it is the best specimen of its kind. That is how so many wonderful and unusual kitchen objects in Le Sanctuaire found their way into the store. It is also how the Cubebe peppers made it here. Jing Tio, the owner of Le Sanctuaire, had been working with a farmer in Surabaya who grew a variety of peppers for his store, including the rare Cubebe peppers, when the old farmer decided to call it quit. The quality of peppers that the farm produced was so good that Jing and his family decided to take it over. Now he sells the amazing and exotic peppers from his own farm at his store and directly to the likes of Alain Ducasse. It is this kind of dedication -this near madness pursuit of the absolute best- that convinced me to give them my Independent Food Festival Award this year. The Indenpendent Food Festival and Awards 2006, in case you didn't know already, is organized by Hillel of Tasting Menu, with Food Bloggers from all over the world giving their votes to the best of everything relating to good eating and cooking. Last year, my award went to June Taylor's Candied Seville Peel in Rose Geranium Syrup. This year, it goes to Le Sanctuaire, for being the rarest and most amazing kind of cookery shop. What else might you find at Le Sanctuaire, you asked? Our very own First Lady of Preserves June Taylor is sharing her secrets of marmalade making! You too can get in on this by signing up for one of her two hands-on classes on 3/25 and 4/22. Hillel of Tasting Menu is hosting the second annual Taste Everything Awards, where food bloggers honor the best producers or sellers of food and other kitchen things. Check out the listing of the first two days' worth of awards here. And check back chez moi Thursday to see who I'm giving my Taste Everything award to. Chris Cosentino goes to Britain! And so can you. You can join a gastronomic tour to Britain led by Chris Cosentino of Incanto. Chris will take to you visit Prince Charle's organic garden, go Woodcock hunting, see an Oyster Farm in Marsea, have a very piggy day at the famous River Cottage, dine and St.John and the Fat Duck. Not to mention the Only in London experience of breakfasting at Smiths at Smithfield, with the butchers in blood-soaked apron from Smithfield meat market next door. And we have the first born! Our lovely Farmgirl Susan has got the first born ewe of the season. She is called Rose, and the honorary ownership of her goes to Jennifer New, the lucky donor in our Menu for Hope II campaign, where together food bloggers from all over the world helped raised more than $17,000 for UNICEF's funds for the earthquake survivors in Northern India and Pakistan. It's been just a few days, and it seems I am settling in to my new life pretty well. 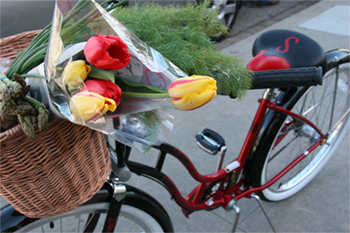 I rode my brand new red bicycle to the farmers market for the first time. 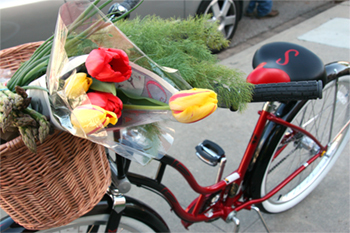 The bike was a very thoughtful -and hopeful- gift from someone last Christmas. It has a cute wicker basket that comes off at a touch of a button so the basket can go shopping with me while the bike waits. How cool is that? Santa Cruz feels far more like a small village than a good size city that it really is. It probably helps that we live so close to downtown that everything is either walking distance or riding distance. Mind you, everything here is nothing much compared to what's up in the city but I think I'm going to like it anyway. Adding to the village-y feeling is the fact that our best friends in town, Eric and Cill, live right across the street. They checked on me to make sure that I was fine on my first night at the new home, when David was gone on a business trip. They took me to dinner at Eric's bistro, Oswald, the second night, and earlier this evening Eric was here building bookshelves. It's like we've got our own little Mayberry going over here. The new house is agreeing with our little cat pretty well too. I don't think she's ever lived in a house with a staircase: she has been so captivated by it that she spent all day today sleeping on this step and that. She's also been peering outside the huge Victorian windows, soon she'll even muster enough courage to venture outside. I am really going to like it here.